June 26, 2015 – On June 27, 2013, NASA launched IRIS, the Interface Region Imaging Spectrograph. 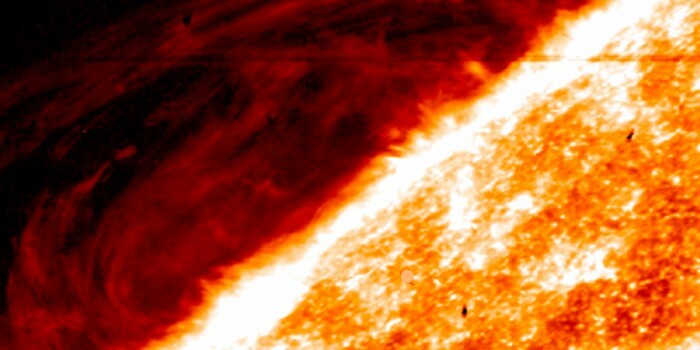 IRIS gives us our first detailed image of a layer of the sun’s atmosphere called the chromosphere. Designed and built by the Lockheed Martin Solar and Astrophysics Laboratory, IRIS has opened a window of discovery to the sun’s atmosphere. Boasting the highest temporal and spatial resolution to date, IRIS provides imagery and a special kind of data called spectra. An imaging spectrograph not only takes an image of the region of interest, but also has a small slit in the imager (seen as a dark line about half-way across the image) which passes a thin ribbon of light to a spectroscope. The spectroscope spreads the light out in its component frequencies or spectrum. Monitoring of specfic spectral lines provides additional information on the velocity (and therefore temperature) of plasma in the observed region. In the visualization presented below, the IRIS slit-jaw imager (SJI) takes images with two different filters, one at 1330 Angstroms (gold color table), the other at 1400 Angstroms (bronze color table), and these images are displayed overlaying corresponding imagery from the Solar Dynamics Observatory (SDO) 304 Angstrom filter (grayscale). The spectra, in this case a closeup view on the 1403 Angstrom line from 3-times ionized silicon (designated Si IV), is presented on a semi-transparent plane perpendicular to the images, at the position of the slit in the imager. This allows us to see correlations between features in the images and spectra. For example, some of the bright spots in the image correlate to wider regions along the line suggesting higher temperatures and/or velocities of the plasma emitting the spectral line. To better examine the region, the instrument also scans the slit over the region of interest, collecting multiple spectra. This allows scientists to compare and correlate structures seen in images with speeds and temperatures of the plasma. The IRIS observatory was designed and built by the Lockheed Martin Solar and Astrophysics Laboratory. The Harvard-Smithsonian Center for Astrophysics in Cambridge, Massachusetts, built the telescope. Montana State University in Bozeman, Montana designed the spectrograph. NASA’s Ames Research Center in Mountain View, California provides mission operations and ground data systems. NASA’s Goddard Space Flight Center in Greenbelt, Maryland manages the Small Explorer Program for NASA’s Science Mission Directorate in Washington, D.C. The Norwegian Space Centre is providing regular downlinks of science data. Other contributors include the University of Oslo, Norway and Stanford University in Stanford, California.